The Bully Bug by David Lubar. A Monsterific Tale. Review: Do you like bugs? Do you like genetic mutations? Then this book is the book for you. 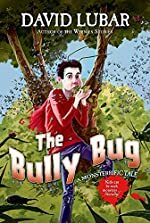 The Bully Bug by David Lubar is a book about a boy named Lud that turns into an insect. Lud and his brother Bud are playing in their backyard when they decide to tip over an oven. They just happen to find a cereal box under it and Bud decides to open it and out comes a swarm of radioactive mimic beetles. They bit Lud and about three days later he turns into a bug. Lud needs help immediately. So he turned to an unlikely person for help. A nerd, and his name is Norman. Although Lud has beaten Norman up a countless number of times he still chooses to help him. I loved The Bully Bug; it is amazing! The best part has to have been when the final transformation is in process. I recommend this book to people who like fantasy genres and people that are around the age of 9-10 because there are bigger words here and there but other wise the book is perfect for kids around that age. Although I don't usually enjoy fantasy books, this one surprised me. Usually when you think of fantasy you think of kingdoms and kings and queens, well this fantasy story is the complete opposite. It's just about a boy that lives in a small town and that he turns into a bug. The book is really astounding! I want to read this book 15 times over. The book has so many fantasy like features it's incredible. The characters are really well developed. David Lubar's writing style makes The Bully Bug more interesting then it already is. The moral of the story is don't tip over ovens and open up the cereal boxes underneath them. Review written by Aaron (6th grade student). We would like to thank Starscape/TOR for Teens for providing a copy of The Bully Bug for this review. Have you read The Bully Bug? How would you rate it?